The weapons employed by most soldiers in both armies were more or less the same,smoothbore muskets firing a ball, it was their use which decided the day. The average British infantryman man was armed with a.75 calibre Brown Bess or East India Pattern musket. It had an effective range of 100 yards . It could be fired several times a minute by a veteren .It also had a foot and a half long bayonet, which British troops were masters in using. Americans troops, were more shy in its use . The Americans, however, were good with fighting with knives in close quarters. They learned this from fighting with the indians.The British 95 Rifle Regiment was armed with Baker rifles , which had a range of up to 200 yards .The 95 was used for the most part in the battle as skirmishers . The two regular American Army units used the .69 calibre 1795 Springfield musket. A veteren could fire off three shots a minute.It had a 15 inch bayonet .The militia and volunteers were armed from everything to the latest model 1795 to hunting pieces, blunderbusses and French and Spanish weapons .A majority of the American rifles used were 'Kentucky' rifles, used by the 'dirty shirts' and made by hand .They were not designed for warfare, but for hunting and self protection .A good marksman could hit a man at 300 yards . 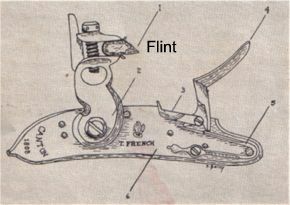 Flints were issued with ammunition, one flint lasting usually 20 rounds before becoming useless. there was a serious shortage of flints among the Americand till Lafitte provide a supply from his stores . 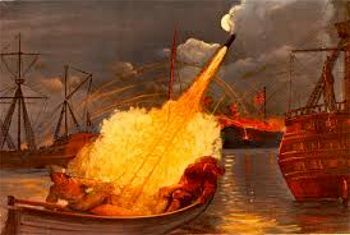 It was the Congreve rocket that were those in '...the rocket's red glare..' Two sizes of Congreves were used in New Orleans, 12 and 32 ounders. Congreves were used to great effect in the battle before Washington, causing the American force to flee. They were unprdictable weapons, which in some cases returned to where they had been fired from . By the time of the Battle of New Orleans, the Americans had learned that its bark was worse than its bite .